Today is our 10th wedding anniversary. Ten years ago today I got married to the most beautiful, wonderful woman in the world. As B mentions in her post today, we didn’t eat much at our wedding. During the first part of the reception, we were locked in a room together (a custom which we didn’t want to do but was forced upon us by an overzealous cantor). According to the tradition, a couple is supposed to consummate the marriage right then and there. Unfortunately, it was hot out and the room had no A/C. Plus, being in our temple locked in a room we didn’t want to be in didn’t help the mood. (Of course, even if we were in the mood, there was no way I’d have been able to get B out of her wedding dress in the period of time we were given.) Luckily, we were given food to eat. Not so luckily, it was hot appetizers. Yes, hot appetizers in a very hot room while we were wearing a very hot wedding dress and tuxedo. After our wedding lock-down, we munched on some leftover appetizers but mainly had to greet people. Then came the wedding dinner. We managed a few bites of food but most of our time was spent walking around and talking. No real time to enjoy the meal. We only really got to eat after the wedding was over. We went back to B’s parents’ house for a bit and ate and actual meal consisting of our wedding leftovers. This year, to celebrate our anniversary, I would love to drop the kids off at B’s parents and escape with B to a romantic weekend getaway. Unfortunately, reality has only given us the night. So we will be going to a local Thai restaurant tonight sans kids. Imagine, a whole meal where we don’t have to hear whining about what food the restaurant has, when it is coming out, how much they should eat or whether they need help with a potty run. A dinner together where the conversation can be adult (as in grown-up, not as in X-rated) in nature. 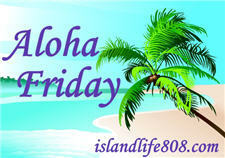 My Aloha Friday question for today is: When you go out on date nights, what do you do? How often do you get to date your spouse? Thanks to Kailani at An Island Life for starting this fun for Friday. Please be sure to head over to her blog to say hello and sign the McLinky there if you are participating. Happy 10th anniversary.. we just celebrated our 10th also this month. When we go out for date nights it’s usual dinner at a nice restaurant and maybe some window shopping or movie. However it will be at least a year more before it’s possible with our #3 being only 9mths old. I get to date R about once a mth but it’s not really a date as the baby goes along. I have also been married for 10 years this year, but have little ones right now and no real time for dates. We are talking about setting time aside for 2 dates at least a month. That will be great considering my husband is a farmer and his long hours make getting away difficult. We rarely ever go on dates. With four kids, we’re just always too busy or money is too tight. We did have a nice quiet dinner out by ourselves the other night – we hardly knew what to do with ourselves, LOL! Kari recently posted..Aloha Friday – Approval Denied! We have date nights, sometimes several times during a week, it all depends. We got out to dinner, movies, festivals. Being a mother of five children, I know the feeling of getting a night out alone. However, they have made me a Great-Gramma now. We don’t have date nights, we have date lunches each day, I love eating lunch out each day. After all we are retired, no kids in the house anymore. My spouse courts me everyday, like I said, I am now a pampered lady. hee, hee. Gigi Ann recently posted.."Aloha Friday"
Happy 10th Anniversary! It’ll be 11 years for my wife & I this year. For us, date nights are few & far between, though we got a date night the weekend before last & went out to a movie. But generally if we have ANY time to spend on our own, we like to spend it outside taking walks. The Jefferson Memorial is our favorite. When we go out on dates we usually do the usual dinner/movie. Yes, eating without kid chatter is a rare treat! Our anniversary and my birthday is only one day apart, so we try to get babysitting for the whole day on one of those and do something special. My favorite was a day canoeing down a river…just us and the rock swallows! That only comes once a year though. Gale recently posted..50% Off Business Cards, Bookmarks and Fun Cards! Well, I don’t have children at home anymore, so guess this question really isn’t for me. We usually go out once a month lately because of my disability, but its getting better so hopefully we’ll be out and about more. Have a nice weekend. Xmasdolly recently posted..Friday Photo Flashback, Follow Friday and ALOHA Friday! I’m not married (divorced). So, I guess it doesn’t apply to me either. I cannot find your followers or I would follow you. Have a good night. Let me know & I’ll come back. Tom recently posted..Friday Photo Flashback, Follow Friday and ALOHA Friday! I can’t even remember the last date night we had. Maybe for my birthday a year ago? LOL! 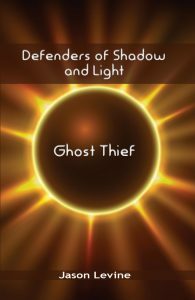 Defenders of Shadow and Light: Ghost Thief – now available!